Venezuela Flash Briefing: End of Maduro? Please note, we are unable to accept walk-in registrations for this program. The Council appreciates your support and understanding. Venezuela is a disaster. Perhaps it was time for a Juan Guaidó? Last May, Venezuelan President Maduro secured another six-year term in an election widely seen as sham. Now opposition leader, Juan Guaidó, has declared himself acting president as the world watches millions of Venezuelans starving, ill, and fleeing the country. Russia is on Maduro’s side. Russia has issued threats against the U.S. and its diplomats posted in Venezuela soil if they do not leave the country. And they are not leaving, as per President Trump’s command. What is clear? This is not only a political crisis. It became a global diplomatic crisis and, above all, a humanitarian crisis that continues to escalate. It has developed from an internal upheaval in Venezuela into a proxy conflict between the U.S. and Russia. Where is this heading? The Council’s very own President Charles Shapiro, former U.S. 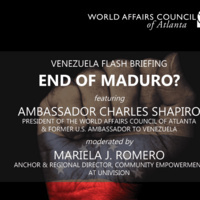 Ambassador to Venezuela, in conversation with Mariela J. Romero, Anchor at Univision, will unpack the behind-the-scenes of this chaos, and shed some light of what to expect as an outcome.